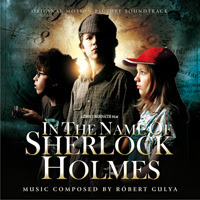 Howlin' Wolf Records proudly presents IN THE NAME OF SHERLOCK HOLMES by Hungarian Film Composer Róbert Gulya (ATOM NINE ADVENTURES). IN THE NAME OF SHERLOCK HOLMES, directed by Zsolt Bernáth, is a fantasy adventure tale about two teenaged fans of Sherlock Holmes who investigate the mysterious disappearance and transformation of local children using the sleuthing skills of Sir Arthur Conan Doyle's Watson and Holmes. Bernáth's film pays homage to classic youth fantasy/action/adventure tales like E.T. and THE GOONIES. I am thrilled about this score and the Howlin' Wolf family as we embark in a new journey, you will enjoy this... so take the journey with us. First I've heard of it! I'm a huge fan of Sherlock Holmes. The music is great! What a cool idea. Young Sherlock Holmes meets Goonies. This seems like a pretty exciting idea! wow. looks like an interesting film! That looks like a great film, and I love Holmes! I'm already freaked out about the movie...blood, creepy kids...EEEEKKK!